In the last few days voters in Elk Grove and probably throughout the state received what some in the political business call a slate mailer. These slate mailers typically come with either a particular viewpoint on an issue, say reproductive rights, or from one of the two major political parties. Voters need to take care when examining the contents of these pieces and closely examine who is sending them. One that was delivered, which we shall call "Elk Grove Democrats!" arrived in voters mailboxes last week. At first glance, it appears that this is from the Democratic Party as it has two leading party leaders - Sen. Barbara Boxer and California Attorney General Kamala Harris prominently featured. It gives the impression that Boxer is endorsing Harris for the seat she is vacating. When you open the single fold piece, voters will find a profile of Harris along with five Superior Court Judicial candidates from throughout the state. 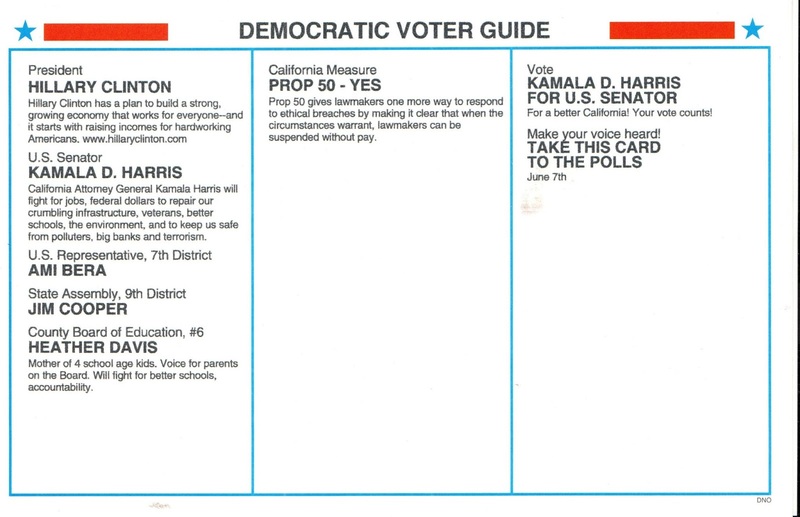 On the back side, which is headlined with "Democratic Voter Guide" lists endorsement for Hillary Clinton, Harris, Dr. Ami Bera, and Jim Cooper - all well known to Elk Grove voters as Democratic candidates. There is one person listed on the mailer that is not a Democratic candidate. That person is Sacramento County Board of Education Area 6 candidate Heather Davis. Wife of Elk Grove Mayor and Democratic Party Member Gary Davis, Heather Davis is not a member of the Democratic Party. In fact during the recent Elk Grove-South County Democratic Club endorsement proceeding for that race, Davis was not interviewed or considered because she is not a member. Two of the three other candidates in that race, Democrats Orlando Fuentes, and Stephanie Nguyen were considered, with the endorsement going to Fuentes. 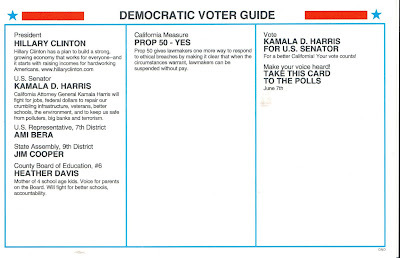 As we noted yesterday, Davis supports charter schools which many Democratic voters, union members, leaders and elected officials oppose, seems to be trying to trick Democratic voters into voting for her. If a candidate is dealing in falsehoods and concealing their real agenda while running for office, what more if they get elected? Elk Grove voters, take note. If H. Davis is not a Democrat, then what is she registered as? In 1968, Pat Paulsen announced he was running for President under the Straight Talking American Government Party, or the S.T.A.G. Party. Davis: just another dirty politician. Big money will buy her in and, in the process, she will sell us out. The Charter School money and agenda is so thick, I don't know how anyone could back her with a straight face. 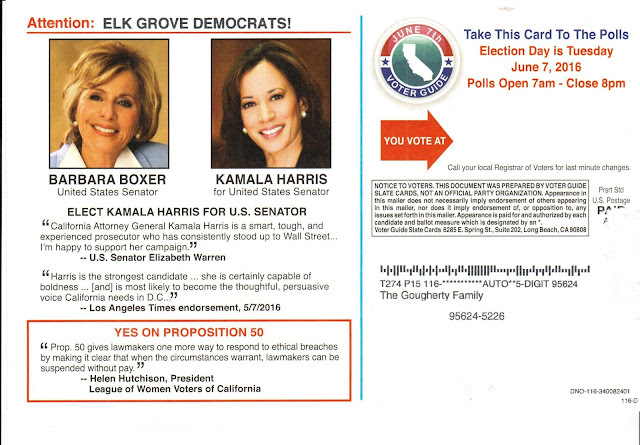 These deceptive campaign mailers implicate both members of the Davis family, Gary as well as Heather. Gary is the campaign pro, and I am sure has been advising his wife on the 'mutual' self-interest. Heather's mailers are just a little too 'cute' and lie by omission. Hopefully, enough voters will be informed and turned off by what is being put forth by Heather (and Gary). Vote NO to the charter school 'couple', since a vote for Heather is a two-fer. A Heather Davis "Hispanic woman, paid walker" dropped a new flyer off on my door tonight. It has a pink pencil attached (not Ly's potted plants at least), and says she will be the only Mom on the Board if she is elected.